In 1950, director, Joseph L. Mankiewicz, brought All About Eve to the big screen. Starring Bette Davis, it told the story of Margo Channing a highly successful, but ageing Broadway actress, who begins to feel threatened by the youthful Eve Harrington, a doting fan who worms her way into Margo's life. Winning six out of its fourteen record-breaking Academy Award nominations, it went on to be adapted into two radio shows in the years following, and then, in 1970 was turned into stage musical. It is hard to believe that it has taken forty-nine years for this classic tale of rivalry to make a comeback, but it was well worth the wait. Now showing at the Noel Coward Theatre, All About Eve makes an overdue return to the stage thanks to director, Ivo van Hove. 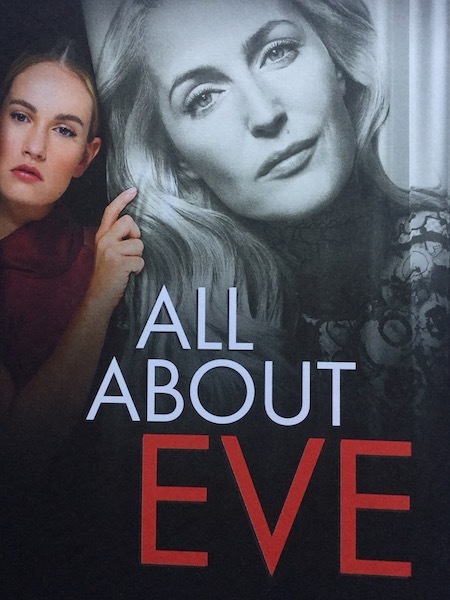 Starring Gillian Anderson as Margo Channing and Lily James as Eve Harrington, the play has a stellar cast that cannot be faulted. Anderson captures the dry-witted humour of every line with pitch-perfect intonation, while James is able to contort her facial expressions into a wide range of creepy undertone malice. Meanwhile, a clever storytelling technique brings supporting cast member, Monica Dolan, to the forefront. Playing Margo's close friend, Karen Richards, she narrates events to the audience, making her the most personable character in the play. One of the challenges often faced in the theatre is conveying an actor's countenance to an audience when they are so far away, but Hove produced some phenomenal stagecraft by utilising modern technology to its fullest. A large screen on the stage wall provides a very close up and personal experience, not just showing us surface detail, but delving deep into Margo and Lily's psyche. 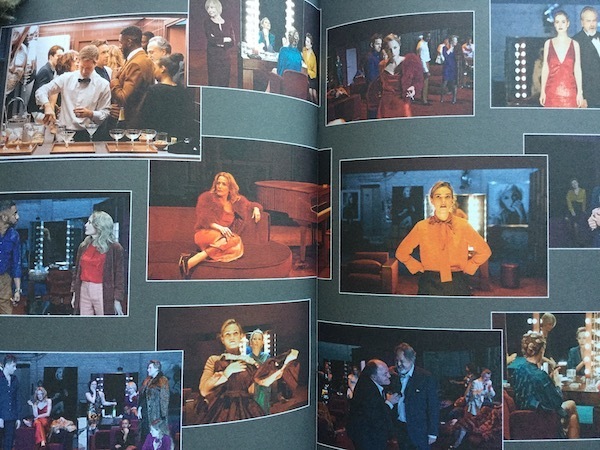 The cameras don't just enhance what we see happening on stage in front of us, they also reveal 'behind the scenes' footage going on off stage. This is a clever piece of meta-fiction as the real set also takes on the role of a fictional set within the world of the play, with the backstage in view. All About Eve uses parallels to great effect, sometimes with up to three concurrent events on display simultaneously. The stage is made up of three walls, which rise halfway off the floor so you can see what is happening in the background while the main focus is out in front. There is also a small cubicle with a camera, forcing the audience to become voyeurs during the characters' private moments of distress. These feelings of tension and unease are intensified with subtle reverberating music, which seamlessly synchronises the multitude of events taking place at the same time. With all the technical wizardry, it could have been so easy to lose focus on the importance of the story itself, but Hove created the perfect balance between spectacle and dramatisation. Nothing is gratuitous; every element enriches the narrative. At the end of the day, it is the exceptional acting that keeps the audience gripped. 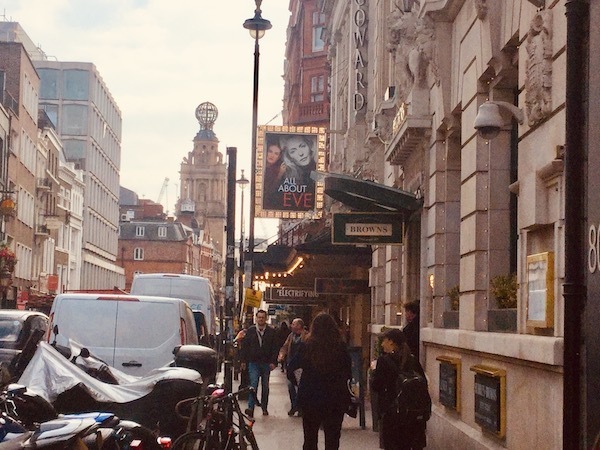 All About Eve is playing at the Noel Coward Theatre until the 11th May and can be booked online or by calling 0844 482 5138.